If you're looking to add elegance and style to your Sharpie marker pen, look no further than this Sherpa pen shell with dice decor. For those who are unaware, the Sherpa is a unique pen shell introduced in 2008 that holds a variety of disposable pens and markers including Sharpie - the magician's staple pen. Each Sherpa is designed with an innovative cap to keep the colour of your marker or pen bold and fresh every time, and this model features a black finish with white dice decor. 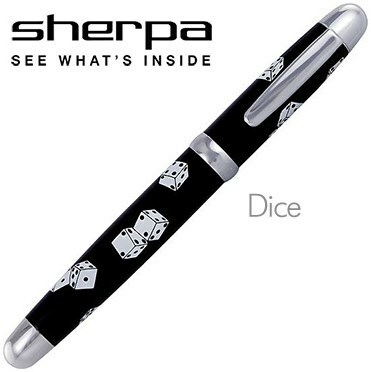 Your purchase includes the Sherpa pen shell with dice design, as well as a standard Sharpie marker pen.